In its earliest days of settlement, Middle Park area residents and travelers doctored themselves using whatever remedies they were able to concoct on the scene of accident, illness, or injury. Dr. Ernest Ceriani was a graduate of Loyola Medical School, and served his internship at St. Luke’s Hospital in Denver. In 1942, he married a nurse, Bernetha Anderson, and joined the Navy, serving until 1946. He began a surgery residency in Denver, but was unhappy with city life, city medical practice and its politics. He came to practice in Kremmling in 1947, working for the Middle Park Hospital Association. The Association had purchased the home of the previous doctor to remodel and serve as a hospital; it employed 2 nurses as well as the young doctor. The doctor was general practitioner, seeing patients in office, hospital, and home, often as far away as Grand Lake. He was as self-sufficient as he could be, developing his own X-ray films, for example, as a cost saving measure. Medical practice for an isolated doctor was challenging. Consultation with other physicians was difficult if not impossible and keeping up with medical journals was daunting. “Doc” Ceriani was dedicated to his community and to his practice, often returning to the hospital or going to an accident site to treat illness or injury when he had planned to take some leisure time. The community depended upon him to listen to their recitation of symptoms and make sound judgments in the art of healing. Their “Doc” was not just a medical corporation putting patients through procedures--he was a highly dedicated professional in the world of medicine. He truly cared about his community and its members. Life magazine honored him with a large article, which covered, in depth, the challenges of practicing medicine in such an isolated area. From childbirth, to ranch injuries, to treating the tourist who suffered from altitude sickness, the article showed the American public the human side of this very dedicated physician. “Doc” practiced until 1986, in Kremmling, retiring at the age of 69. He died two years later. 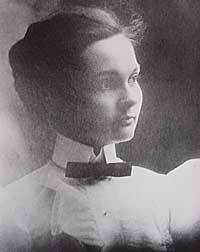 Susan Anderson was born on January 31, 1870, in Nevada Mills, Indiana. 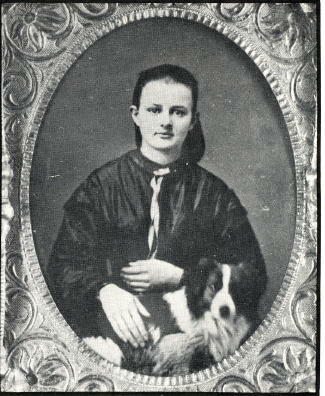 Her parents, William and Mary Anderson, were divorced in 1875. Four-year old Susan never forgot her parents arguing and her mother crying before her father literally grabbed Susan and her brother John, who was three years old, from their mother at a railroad depot. He jumped on the train as it was leaving the station and took them to Wichita, Kansas, where he homesteaded with Susan’s grandparents. Susan’s father, Pa Anderson, had always wanted to be a doctor, and he vowed that one of his children would fulfill that role, which he had been unable to accomplish. John, however, was more interested in roping cattle and playing than becoming a doctor. Contrary to John, Susie watched her father, a self-taught veterinarian, as he worked on animals. She absorbed important knowledge for her future as a physician. 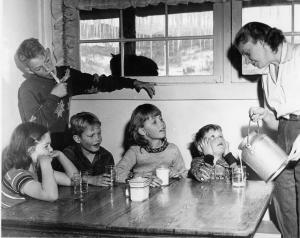 Susie was less interested in the lessons that her grandmother taught her: manners, housework, crocheting and cooking. Shortly after Susan and John graduated from High School in 1891, Pa Anderson remarried and became very domineering, insisting that everything be exactly as he demanded. At about the same time, the gold strike in Cripple Creek, Colorado, caught William Anderson’s attention, causing him to sell his homestead in Wichita and move the entire family to Anaconda, CO, which was about one mile south of Cripple Creek. Very rare for the time, Susan pursued an education in medicine and graduated from the University of Michigan and started practicing in the mining towns of the area. In her 30's Susan contracted tubuculosis and came to the Fraser Valley in hopes of a cure in the clear mountain air. Not only did she regain her health, but she he practiced medicine from 1909 to 1956 in Grand County, a total of forty-seven years. People in the area were very poor and seldom paid in cash. They usually gave her meals for payment. This suited her fine because she did not like to cook or keep house, which was always messy. Because the railroad ran beside her shack, she often would be called to various parts of the county, even at night. Doc. Susie would flag down a train and ride wher ever she needed to go, free of charge. She also treated the men working on the railroad and their families in Fraser and Tabernash, which was about three miles northwest of Fraser. Around 1926 Susan became the Coroner for Grand County. One time she hiked eight miles on snowshoes to a ranch because she was con cerned about a woman who was due to deliver her baby soon. That night the mother gave birth to a baby girl. While there, the four-year-old son had an appendicitis at- tack. Neither of the parents could take the boy to Denver for surgery. Doc Susie took him by train. A blizzard hit, blocking Corona Pass. The men passengers were called out to help clear the track It wasn't until the next morning the train arrived in Denver Doc Susie had no money for a taxi fare. The passengers gave her the taxi fare to get from the depot to Colorado General Hospital. Doc Susie stayed with the boy during the surgery from which he fully recovered. Another time Doc Susie rented a horse drawn sleigh to go as far as she could, then snow shoed into a ranch in a storm to treat a child with pneumonia. She had the rancher heat his home as warm as he could, heat water and then put the child in a tub of steaming hot water and open the door to make more steam. By morning the child had recovered. SDoc Susie lived to be ninety years old. The last two years of her life she was cared for in a rest home by the doctors for the Colorado General Hospital out of respect and love. Susie wanted to be buried beside her brother in Cripple Creek, but because of bad record keeping, no one could find his grave until later. She was buried in a new section of the cemetery. When the residents of Grand County learned there was no head stone, they took up a collection and erected a headstone. Susan Anderson never married, but she said she had delivered more children than any one and claimed them as her children. Her family was everyone in Grand County. Her home still stands in Fraser and the Cozens Ranch Museum has a display of her life and medical tools. The people of Grand County have been lucky to have good doctors from early times to the present. Such a one was Dr. Sudan. Archer Chester Sudan was born on a farm in Sioux Falls, S.D. in 1894. While still quite young, he discovered a talent for healing - mainly of sick or injured farm animals. The notion of medicine as a career led him to leave his family and move to Chicago to live with a married sister where he attended high school and college. To support himself, he worked as a barber and as a summer harvest hand in the Dakotas. He received his bachelor's degree and a master's degree from the University of Chicago and later graduated from Rush Medical School. Upon graduation in 1925, Sudan came west to intern at Denver General Hospital. There he met Tuleen Swift, a pretty little nurse from Kansas City, who later became his wife. 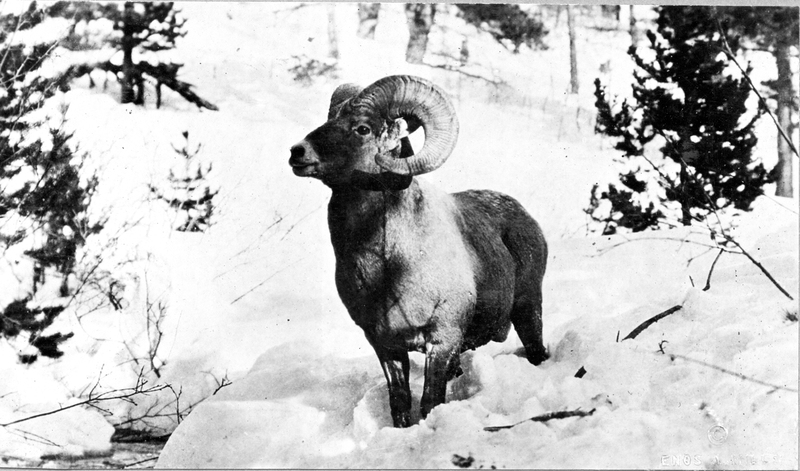 His first interest was teaching and research, but in 1926 his life took a major turn when he came to the mountains of Colorado to fish the area around Kremmling. As he was chatting one day with local druggist, C.C. Eastin, about potential fishing holes, a woman hurried in. She had four little ones at home, all ill with acute tonsillitis. 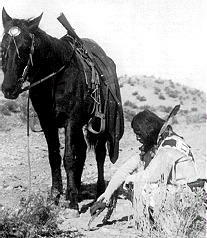 Gathering his medicines from his tent at the edge of the Colorado River, the young doctor hurried to their house to treat the youngsters. Before long, other neighbors made their way to his tent. Dr. Sudan liked the country and the people so much that he took leave from his Chicago job and brought his wife to the high country where they set up practice in this sparsely settled rural area. He quickly came to know all about the bad roads, lack of sanitation facilities and electricity. In the fall of 1926, he was introduced to the cow trails that represented roads to ranches back in the hills. A rancher had shot himself and was bleeding profusely. The rancher's wife was trying desperately to stem the flow of blood with towels. Guided by his new friend C.C. Eastin, the young physician headed out into the evening in his Model T Ford. Reaching the house some 30 miles away, he treated the man, rigged up a stretcher for the car, and started toward Kremmling. Part way there, the car bogged down in mud and Sudan had to hike five miles back to a ranch house where there was a telephone. Calling for a wrecker, he plodded back once again, arriving at his car about daylight. Sudan finally got the rancher to Denver, 130 miles away, where his leg was amputated. The Doctor left him there in the care of capable hands and returned to his home in Kremmling where he could finally take a breather. He was dedicated to healing and sought to provide medical care as good as could be found in a city. He was also civic minded and actively boosted good roads and agitated for improved sanitation, home nursing and public health programs. He served on the school board and town council and was county coroner for a time. He was a sportsman and liked to ride the Gore Range on horseback, hunt, fish and cook out. In April 1933, the Middle Park Times carried a note indicating that Dr. Sudan had built a small hospital having a basement with eight rooms including space for an x-ray machine and a furnace for heating. This building still stands as a part of the Kremmling Memorial Hospital District complex. By the war's end, Sudan was getting tired. This was a young man's country, he felt, and he started planning to move to Denver, to do general practice and research there; he longed for a quieter life. He stayed on in Kremmling while serving as president of the Colorado State Medical Society until September 1947. Finally, 21 years after he came to Grand County, Archie Sudan turned his hospital over to young Dr. Ceriani and made the move to Denver. The following year, the American Medical Association gave him its first gold medal award for outstanding community service as a G.P. Tuleen died in March 1950 and in 1955 Archie married longtime friend and neighbor, Martha Hawkins. The couple traveled, camped, fished and explored the West and Canada. In the late 1960s, Dr. Sudan's health began to fail and the couple built a one level home on Martha's farm in Lafayette. In October 1971, the doctor was shoveling snow when he died of a massive heart attack at age 77. In its earliest days of settlement, Middle Park area residents and travelers doctored themselves using whatever remedies they were able to concoct on the scene of accident, illness, or injury. The cure might have been a poultice of herbs, bread, oil, mustard, or something called Raleigh’s Ointment. It might have been a dip in the medicinal springs at Hot Sulphur, a dose of iodine, arnica or vinegar, castor oil, Epsom salts, or any number of other standbys. The first “doctors” known in the area were Dr. Hilery Harris (1874 or 1876) and Dr. David Bock (1876); both were “self-certified”. Dr. Harris had a predilection for the treatment of animals, while Dr. Bock treated the medical and dental needs of the people. By the mid-1880s, there were a number of doctors traveling through the area, working for various entities and setting up private practices. During the mining boom, there were a number of physicians and surgeons in Teller City, which was then a part of Grand County. Around 1900, the Dunphy and Nelson Contracting Co, a construction firm building roadbeds through the Fraser Canyon for the Moffat Railroad employed Dr. John Wills as company physician. By 1903, the Denver, Northwestern and Pacific Railroad employed Dr. Leonidas Wills, cousin to John Wills, for its employees and families. These types of company jobs provided regular work as well as regular pay for doctors who otherwise would have had little in the way of compensation for their work. Many of the doctors found themselves moving from community to community as the working community moved--from the Fraser Canyon to the Gore Canyon to lay roadbed, or from one logging area to another. Later, work flow was based on government projects such as the construction of the Moffat Tunnel and the Alva B. Adams Tunnel, both of which went back to the old tradition of having a company doctor. 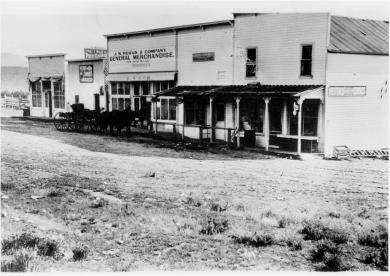 By the time of the coming of the Moffat Line to Grand County, most of the communities had drug stores, many of which were owned solely, or in part, by the local physicians. There, people could avail themselves of all types of patent medicines, drugs, toilet articles, soaps, perfumes, and sometimes even a drink at a soda fountain. It was common for surgery to be done in the home of the patient, or the doctor. Only occasionally, for the worst of illnesses or injuries, did the doctors attempt to transport patients over the Continental Divide to a Denver hospital. Childbirth was almost always in the mother’s home, under the watchful eye of a female neighbor, or a midwife, and rarely with a doctor in attendance. Dr. Archie Sudan built a medical facility in Kremmling and Dr. Susan Anderson remodeled a barn in Fraser to accommodate her patients. Often it was the wife of the doctor, who might be a nurse, who attended the patients. Many of those in attendance were trained by the doctor in charge; some went on to attain certifications as Registered Nurses or other professionals. In June, 1947, the Middle Park Hospital Association held a fundraiser to undertake hospital improvement. The first $20,000 raised went to buy the home/hospital of Dr. Archer Sudan. In total, the group raised between $35,000 and $70,000 to purchase, remodel, and outfit the facility, which was intended to serve all of Grand County, most of Summit County, and parts of Eagle, Routt, and Jackson counties. The hospital had four private rooms, three wards for six patients each, living quarters for hospital personnel, an office, exam room, operating room and an x-ray room. Dr. Ernest Ceriani was the first physician for the new facility. The local rural physicians often called on their colleagues in the city for assistance with difficult cases. They arranged for specialists to visit, consult and perform surgery, saving the patients and their families hospitalization in Denver. Just as today, the need for specialized care presented special difficulties for the rural physician of the early days. 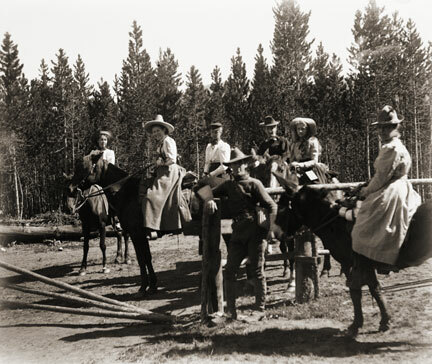 The list of physicians, surgeons, dentists, osteopaths, and veterinarians who served Grand County is lengthy, but the most famous are Dr. Susan Anderson (Fraser), Dr. Archie Sudan (Kremmling), Dr. Mac Ogden (Granby and Kremmling), Dr. Ernest Ceriani (Kremmling), and Dr. James Fraser (Grand Lake). “Medical Practices in Early Middle Park-Grand County” includes extensive information on each. Nestled on a quiet lane in Old Grand Lake City sits the intricately crafted home of Warren C. and Mary O’Brien Gregg, known today as the Spider House – a testament to a remarkable woodcraftsman and his tormented wife. Warren (Watt to his friends) was a dreamer and in the 1870s he left his first wife and a young son in Wisconsin and headed for the Colorado Territory seeking his fortune in the mines of Gilpin County. Upon returning to Wisconsin his first wife died of fever, leaving Warren a widower with a small son. Holding tight to his dreams of the west, Warren eventually ended up in his native Indiana where he met and married 20 year-old Mary O’Brien, in 1884. 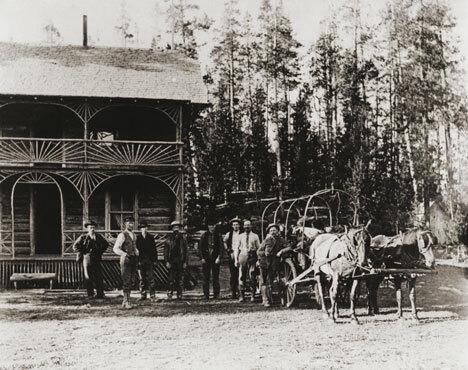 By 1888 Warren packed his new family into a prairie schooner and headed west. Like so many other pioneer women before her, Mary bore a child along the trail, a second son whose short life would send Mary down a dark and tortured path. The family arrived in Middle Park late in the summer of 1888, built a small homestead on the eastern slope of the Stillwater drainage and the newborn died shortly thereafter. Though the years would bring more children, Mary would never quite recover from the loss of her second son. They continued to scratch out a living in this harsh and isolated land, where winters were long and supplies were meager. Warren spent much of his time searching for game and exploring this new country. The Gregg’s moved numerous times, finally purchasing a plot of land from Old Judge Wescott on the west side of the lake. Warren built his family an admirable house, with intricate detail and spider-like webs of wooden elements. Despite the warmth and comfort of this new home, and the close proximity of neighbors, Mary’s depression deepened. Then on a sunny Sunday in 1904, while Warren was working in his woodshop and oldest son Lloyd was having Sunday dinner at Judge Westcott’s, Mary took a gun to her four remaining children and then turned the weapon on herself. The children died instantly while Mary lingered on for four days. The five victims of this tragedy, one girl, three boys and Mary herself are buried together in one grave in the Grand Lake Cemetery. Warren lived in the Spider House for another 29 years. With his son Lloyd, he continued building homes and stone fireplaces. He succumbed to heart failure in 1933. Mary O’Brien Gregg finally found peace in the quiet grace of the little town cemetery surrounded by her children. Almost a century later, as the tall pines whisper their mournful winter song, the Spider House still sits nestled on that quiet little lane. Granby was settled in 1904 and incorporated the next year. The town was created along the railroad line being built by Denver, Northwestern & Pacific, and was a connection with the stage route to Grand Lake. The Granby site was also chosen because of the dry ground and and good view of the surrounding mountains. The town was named in appreciation of the services of Denver attorney Granby Hillyer, who worked to lay out the town site. Its central location makes it a natural trade center for east Grand County. Specialty truck farming, principally lettuce, became a major crop for Granby. At the peak of the market, the Waldorf Astoria hotel in New York City proudly advertised Granby Head Lettuce on its menus. Later, after WW II, Granby was called the “Dude Ranch Capital of the World.” Today the town offers a mix of recreational amenities and residential charm. Here is the story of how Joyce and George Engel became legends in Winter Park and Fraser. In 1945, Winter Park Resort hired George Engel as their very first paid ski patroller. Little could George have known that this job would lead him to his wife, Joyce Hanna, disembarking from a ski train, and together they would call Winter Park and the Fraser Valley their home for life. Along with Joyce and their daughters, the Engel Family would have a lasting influence not only on Winter Park Resort but on the Fraser Valley community as well. In the year following his hiring as Winter Park’s ski patroller, George Engel took on different responsibilities at the ski area, such as plowing the parking lot and collecting rental fees in the bunkhouse. Gordy Wren and Frank Bulkley formed Colorado Outings in 1946 and started the ski school at Winter Park. As director of the ski school, Gordy Wren hired George Engel as a ski instructor. That same year George passed one of the first ski instructor certification exams ever held. By 1949, the Professional Ski Instructors of America was formed and Engel held pin # 12. Gordy Wren was busy practicing for the 1948 Olympics and consequently sold his share in Colorado Outings. This gave George Engel the opportunity to buy into the company and he became director and eventually sole owner of the ski school. George added the Winter Park Ski Shop onto the ski school. George met the love of his life, Joyce Hanna in 1951 as she disembarked from the Winter Park Ski Train. Joyce, with two BA degrees from the University of Colorado, was ready to ski and work. After dating for three weeks, George proposed to his future bride and business partner. The Winter Park Ski School under George’s leadership, and the Winter Park Ski Shop with Joyce at the helm, became fixtures of the ski area. George and Joyce’s two daughters grew up on the slopes. Daughters Wendy and Janet tell wonderful stories from when the family lived in an apartment above the Winter Park Ski Shop. After Winter Park Resort bought the ski school in 1982, they demolished the shop and apartment to make way for the West Portal Station. Along with skiing, another Engel passion was horses which led to their acquiring 40 acres along County Road 5 where they built Casa de Engel. From their ranch, the Engels helped to establish the Winter Park Horseman’s Association and the High Country Stampede Rodeo at John Work Arena in Fraser. Naturally, Janet Engel became a rodeo star. The Engels were also involved with the Middle Park Fair and Rodeo for decades. As community leaders, the Engels transformed Winter Park Resort and the Fraser Valley. They helped start the Fraser Valley Metropolitan Recreation District, the Winter Park Chamber of Commerce and the Winter Park Sanitation District. Joyce Engel was a founder of the Grand County Concert Series bringing live classical music to this rural community. In 1968, George Engel was instrumental in bringing the National Sports Center for the Disabled to Winter Park. The family’s wide-ranging passions enrich all our lives then, now and into the future. The first settlers in Granby realized the sunny days and cool nights were perfect for growing one crop in particular, lettuce. Lettuce farming boomed in the 1920's and a new industry was born. in America. There are even tales that New York's Waldorf-Astoria Hotel bragged of their “Granby Lettuce” on the menu. Then a blight settled into the soil, probably brought in by the wooden crates used for shipping, and the lettuce business was ruined. Since then, ranching has replaced agriculture as Granby's major industry. Before there were any people anywhere, the Creator, "Sinawaf", cut sticks and placed them in a large sack. After many days, this aroused the curiosity of the coyote. When Sinewaf was away, the coyote could no longer control himself and opened the sack. Out came many people who scattered in all directions. Each spoke a difference language from the others. When Sinewaf returned, there were only a few people remaining in the sack. He was furious with the coyote, as he had planned to distribute the people equally in various parts of the land. As there could now be no such equity, there would be wars among the different people, who would fight for the best locations. Of the small group left in the sack, Sinawaf called them Ute or Nuche, which meant "the people". They would be a very brave and strong tribe. Construction on the railroad line from Denver to Grand County began in July 1902. The project, called the Moffat road (officially the Denver, Northwestern & Pacific), was the seemingly impossible dream of David H. Moffat, who spent much of his personal fortune building the tracks over the Continental Divide. The rails pushed higher and higher up the mountains until they reached a station named Corona, meaning the crown of the continent. Corona was the highest point in the world with a standard gauge railroad and the journey from Denver in the winter was perilous at best. Huge snowplows were required on either side of the Divide to keep the tracks clear. Eventually, in the late 1920s, a tunnel was dug through the range, eliminating 22.84 miles of track and the breathtaking journey over Rollins Pass. The railroad reached Granby and Hot Sulphur Springs in 1905 and Kremmling in 1906, and played a significant role in building the population of Grand County. 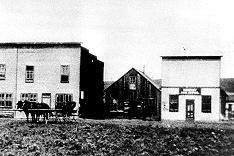 In 1900 the total resident population of Grand County was only 741, but grew to 1,862 in 1910.